An investigation by RISE Project reveals that an Austrian-based company has purchased over the past two years massive volumes of wood from controversial local logging firms. Schweighofer, a company controlled by one of the wealthiest families in Austria, is the main purchaser of Romanian wood and has a significant presence in other countries of the region. RISE Project found out that some of the local firms that sold the logs to the processing plants owned by the Austrian corporation are connected to former Schweighofer directors, local politicians or businessmen with long criminal records. According to documents obtained by RISE reporters, some of the logging companies received loans from Schweighofer in order to maintain and expand their activities. Schweighofer’s most important supplier is the state-owned Romsilva, whose president, Adam Craciunescu, is indicted for corruption in a case of illegal forest restitution. Deforestation is a serious issue in Romania where the next meeting of the Supreme Council for the Defense of the Country (CSAT) has illegal logging as a strategic issue on the agenda. In the past few months, thousands of Romanians took to the streets protesting illegal deforestation. 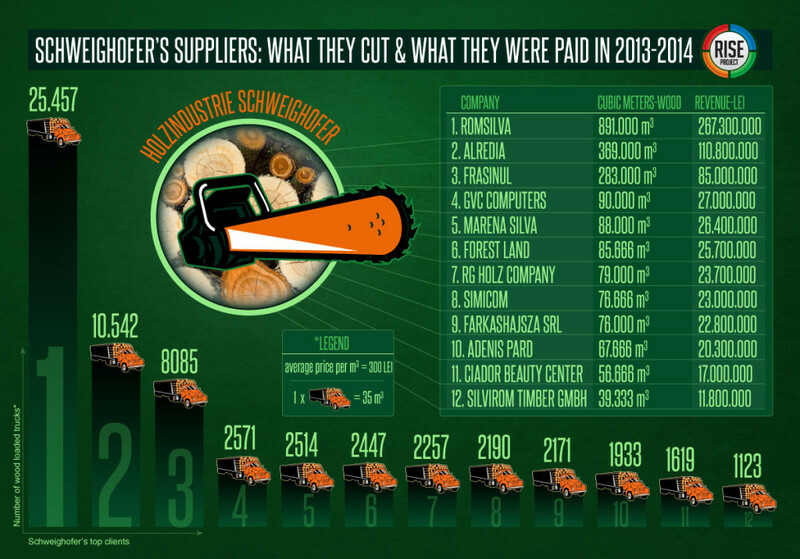 In 2013, Schweighofer bought 240 million euro worth of Romanian forests for a price of 70 euro per cubic meter. About 3.5 million cubic meters of wood arrived at processing plants owned by the company, which is the equivalent of 13 thousand hectares of deforested land. Since 2004, when Schweighofer updated and expanded its production capacity, approximately eighty thousand hectares of Romanian forest have been processed, an expanse three times the size of the nation’s capital, Bucharest, a city with three million inhabitants. Over the next 20 years Schweighofer has the capacity to process some 320 thousand hectares of forest. The full story, in Romanian, HERE.